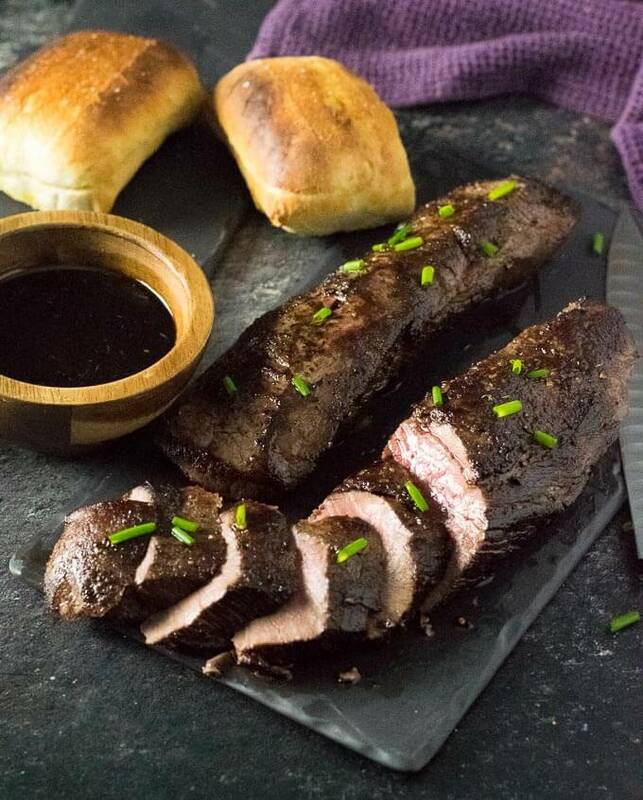 Roasted Venison Loin is served with a balsamic reduction pan sauce, for an elegant preparation of wild game. 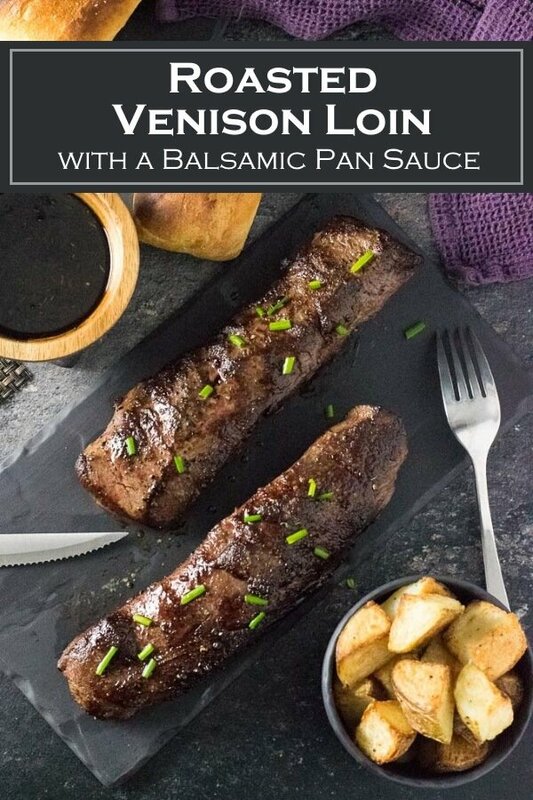 The sharpness of balsamic vinegar offers a nice contrast to the deep earthy flavor of venison and black peppercorns. 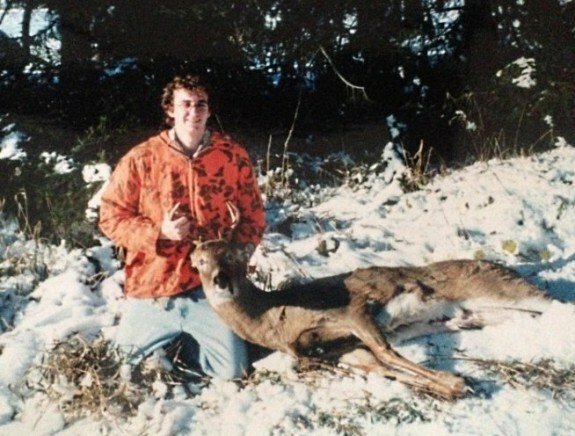 I’ve always loved venison and equally the hunting that was required to get it. I have such fond memories of waking up hours before any teenager would ever dream of getting out of bed, dressing in so many layers that I looked like the blaze orange Michelin tire man, and marching into the pitch black woods with my brother, my dad, and all the memories that tradition brings. I missed more deer than I hit probably, including a grandiose buck that was never even fired at because I had a chemistry textbook sitting on my lap (Yet more proof to a 17 year old that Chemistry is the worst class ever), a doe sitting 15 yards away while I was too busy second-guessing myself to pull the trigger, and one deer that would have ran me over if I let it, while I meticulously slung bullets at every tree in the woods. I still vividly remember the first deer I ever shot and I can’t remember a time being more proud of an accomplishment. I shot it while it was running, probably more luck than anything, but when I realized it went down it was a feeling of euphoria unlike anything else. If we had Facebook in 1998 that deer would probably have been my profile pic for the next year. It wasn’t a large buck, but it was my buck. A few years later we lost access to our hunting land after the lady who owned it passed away. We never found a suitable new place to hunt, and as my dad’s health deteriorated hunting became less of a concern. Before long my hunting traditions transitioned to hunting memories. As an adult, I refused to let my passion for the outdoors be extinguished and I spent a few frustrating years hunting alone in the blaze orange pumpkin patches known as public land. However, this year I was blessed to be able to purchase 40 acres and a cabin up north, and for the first time in 15 years, my dad and I will be reunited in pursuit of a trophy buck on opening morning. Equally as importantly, my stepson will be joining us as we forge a whole new generation of traditions. I still couldn’t tell you one thing I learned from that chemistry book in my tree stand, but I can recite every step my dad taught me about skinning and butchering a deer 20 years ago. Combine that knowledge with someone who knows his way around a kitchen, and I’ve become pretty adept at butchering my own venison and crafting enticing new recipes like this roasted venison loin. If you are lucky enough to have venison in your freezer, don’t take it for granted. Venison should be cherished as much as the memories that go into commandeering it. It has fantastic flavor, can be extremely tender and is exceptionally lean. 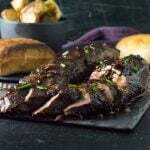 If you are wondering what to do with a venison loin and want a dish worthy of the memories it includes, might I offer a suggestion: Roasted venison loin with a balsamic pan sauce. It is simple, elegant, and damn tasty. Don’t have venison? This can be made with a beef loin as a fine substitute. Venison loin and venison tenderloin are often confused. Venison loin, also known as the backstrap, runs along the backbone of the deer, while the tenderloin is found inside of the rib cavity. If you came here hoping to find a venison tenderloin recipe, don’t fret. This recipe can be used for venison loin and venison tenderloin, just expect tenderloin to cook more quickly. Venison tenderloin can be cooked just like a beef loin. Seer it in a skillet over high heat to form a mouthwatering crust, then finish cooking it in the oven, allowing it to gently come to temperature without the exterior burning. I recommend cooking venison loin to 130-145 degrees. Cooking backstraps beyond that is excessive for a tender cut of meat and will lead to dryness. Have you purchased a good meat thermometer yet? Don’t guess on your cooking time and don’t risk ruining a great roasted venison loin. Spending a little money on a good meat thermometer (affiliate link) will yield constant dividends. You won’t regret it. You have a whole deer to cook up, but don’t worry, I have you covered. Make sure to use some of the venison hamburger to craft some mouthwatering venison burgers, venison meatloaf, and venison meatballs. Also, make sure you don’t waste the neck because that can be turned into an incredibly tender Beer Braised Venison Neck. 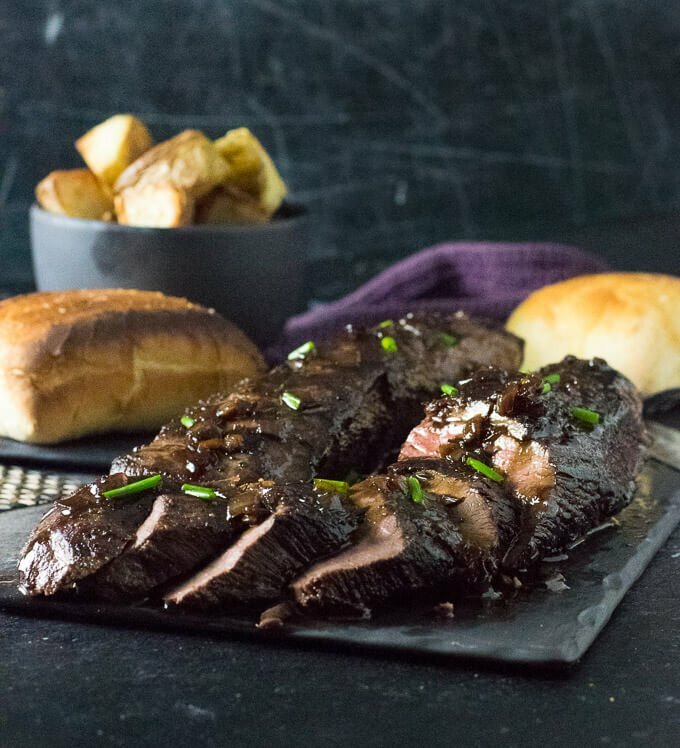 And if you are looking for more venison tenderloin recipes, try my marinated venison tenderloin, this recipe can also be used with the backstrap as well! 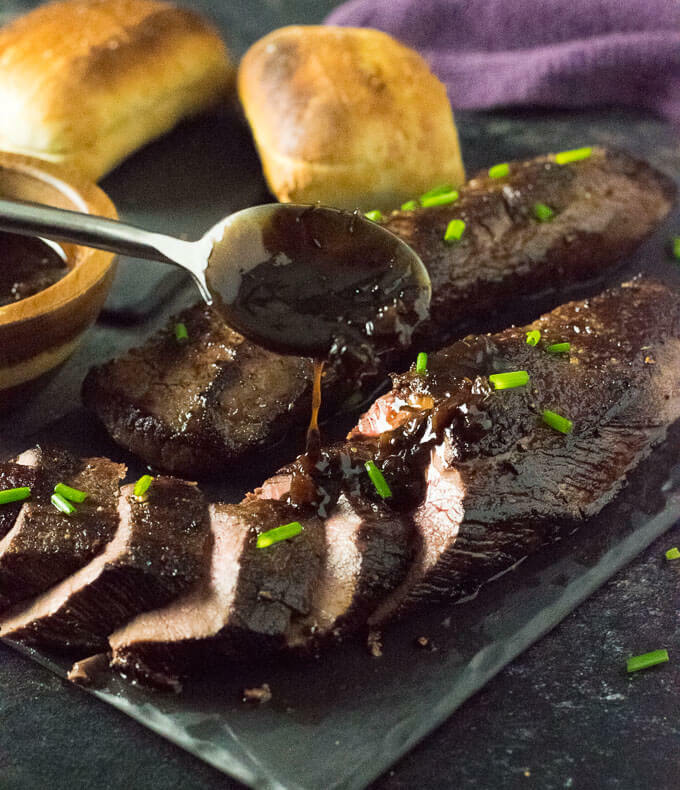 Roasted Venison Loin with a Balsamic Reduction Pan Sauce is an elegant preparation of wild game. 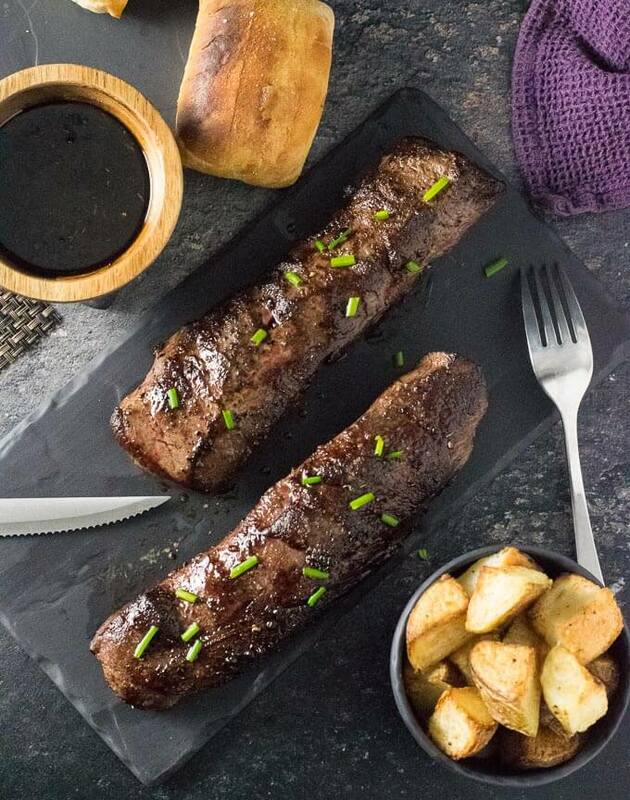 The sharpness of balsamic vinegar offers a nice contrast to the deep earthy flavor of venison and black peppercorns. Coat venison in 1/2 tbsp of oil and coat liberally with salt and fresh cracked pepper. Heat remaining oil in hot skillet over medium-high heat. Add venison and brown on all sides. While venison is in the oven place shallots in the original skillet used to sear the venison and cook until softened. Deglaze pan with balsamic vinegar and add beef broth and thyme. Cook on high until sauce reduces from a water liquid to a thin syrup consistency. Let the venison rest for 5-10 minutes prior to slicing. Troubleshooting: If the sauce is too thick, add a teaspoon of water at a time to thin. If the sauce is too thin, continue to cook and it will thicken. If you have ground venison in your freezer, you are going to want to check out my mouthwatering Venison Chili recipe as well! This recipe was originally published on FoxValleyFoodie.com December 20, 2014. Thoughts on this recipe, or perhaps a favorite hunting memory? Post it in the comments below! And as always, please show your support for Fox Valley Foodie by liking me on Facebook and pinning on Pinterest. Made this tonight, had to make a couple substitutes ( green onions for shallots, chicken stock for beef)as I didn’t have the required ingredients. It was still AMAZING! This will definitely be added to the family menu. Thank you for sharing! This was the best venison ever! Very flavorful enjoyed it ! How long do you cook? My thermometer broke. Help. It will depend on the thickness, but 15 minutes should get your close. You can test its doneness by pressing on it with your finger, if it is still spongy, it is still raw inside. If it is very firm, it is well done. Very yummy! Was delish with a big pile of roast veggies, but I wish I’d had a big crusty bread roll to sop up all the leftover sauce! Delicious, and easy! For the first time ever, I wish i had more venison in my freezer. I enjoyed reading about your hunting memories! Will try this recipe in the future. Fantastic recipe – simple and absolutely delicious! Will be making again! I had no idea what to do with the two small venison filets we were given. I followed you directions except, lacking shallots and beef broth, I used chopped onion and scallion. I seared the filets in a cast iron pan and then transferred them to a sizzle plate that I had placed into the 350 degree oven. I checked after 5 minutes, and they were done. My husband loved them and the reduction sauce. Tried this tonight. Very very good! Will definitely make it again! This was excellent. My medallions were small so I heated my skillet in the oven at 350, then moved the hot pan to stovetop and cooked them on each side for 2 minutes in a little butter and olive oil. They were perfect!!! Can I convert this to a slow cooker? This recipe would not work in a slow cooker, and venison loin, in general, is too nice of a cut of meat to cook for hours on end in a slow cooker. Use cuts like venison roasts and shanks for the slow cooker instead. I have a venison stew recipe on this website you could use the slow cooker for instead if you wish. So good and easy!! Husband and I loved it. One recommendation- next time I would add mushrooms to the sautéed onions! !